Toners are one of the essential skincare products. Usually water based, helps shrink the appearance of large open pores and thereby cleanse the skin further. It helps restore skin’s pH balance. When it comes to toners, I prefer ones that contain glycolic acid. Pixi Glow Tonic have been my most favorite and one that I’ve been using over so many years now. Recently, I got introduced to a toner from Dr Sheth’s. Well, I was quite surprised to know the ingredient list as well as spot a toner with glycolic acid, niacinamide etc in Indian market. 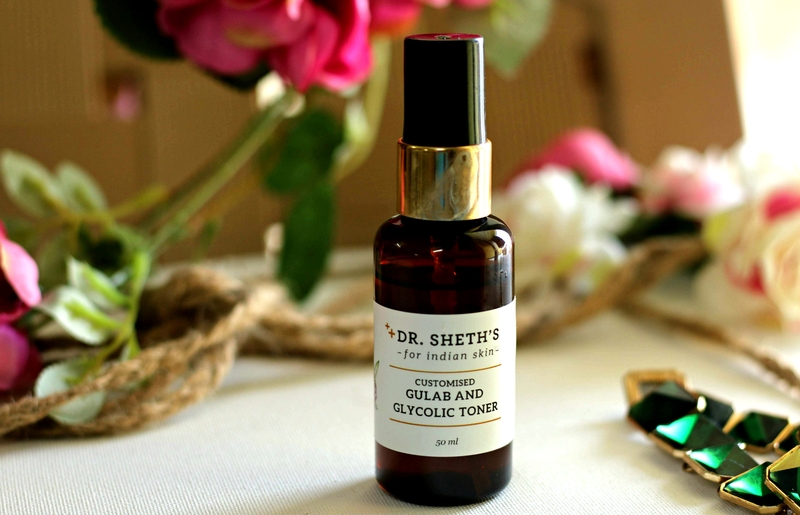 Dr. Sheth’s Gulab & Glycolic Toner is specially created for Indian skin. Combines rose water, which has been used for ages to calm and refresh the skin, along with glycolic acid to exfoliate and brighten the skin. It also includes aloe and calendula to calm, green tea to repair and amino acids to build new skin cells. Allantoin and Niacinamide reduce redness and brighten the skin. 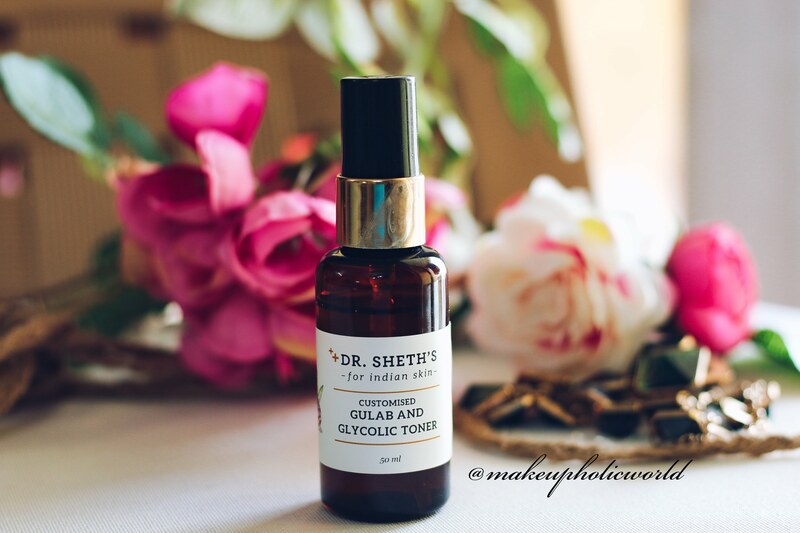 Dr. Sheth’s Gulab & Glycolic Toner comes in a 50 ml spray bottle and retails for INR 499. It’s easy to use as well. Right now it’s available on the website. I was one of the few lucky people who got to try the product before it got available for sale. It has a pleasant fragrance and it feels a slight tingle sensation upon using it. very mild though. As my skin is used to glycolic toners. I loved using this as well. It has 5% glycolic acid. Combines “Rose water which has anti-inflammatory properties [help soothe irritated skin, get rid of acne etc. Also helps clean pores and tone the skin] along with glycolic acid to exfoliate and brighten the skin. It also includes aloe and calendula to calm, green tea to repair and amino acids to build new skin cells. Allantoin and Niacinamide reduce redness and brighten the skin. Glycolic toners helps tone, brighten and exfoliate the skin. The glycolic acid allows mild exfoliation which enhances penetration of actives from serums and creams. While Glycolic acid toners generally suit all skin types, People with extremely sensitive skin must do a patch test before using. There are several benefits of introducing a glycolic based toner to your skincare routine. Note – If you are new to acid toners; make sure you use not more than two times a week initially and depending on your skin tolerance you may use it daily. Always remember to follow up glycolic acid with sunscreen because glycolic acid makes your skin more vulnerable to sun damage. If your skin has a lot of clogged pores, acne spots etc – You might want to give this toner a try. It helps clear up blocked pores, helps your skincare products absorb faster. As it has the unique combination of glycolic acid and niacinamide together; It is effective in minimizing the appearance of age spots, acne spots or other hyperpigmentation. Post cleansing at night, spritz 1-2 pumps on the face and wipe or gently dab the product using a muslin cloth/cotton pad. 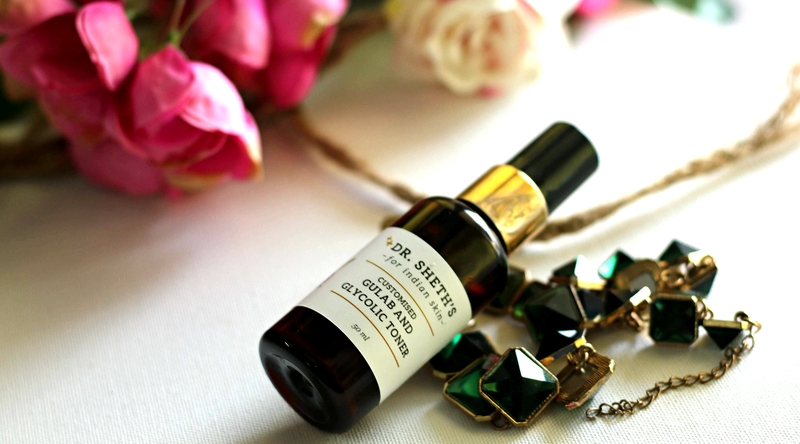 Overall, Dr. Sheth’s Gulab & Glycolic Toner is a effective toner with 5% glycolic acid. Combines rose water along with glycolic acid to exfoliate and brighten the skin. Also includes aloe and calendula to calm, green tea to repair and amino acids to build new skin cells. Allantoin and Niacinamide reduce redness and brighten the skin. Specially formulated for Indian skin. It control and balance sebum production. Refine and reduce the size of pores. With regular usage of this toner, you’ll be able to see a significant reduction on spots and overall skin texture. Specially tested on Indian skin and easily available in Indian market make this toner really a must have! ** Product sent by brand/PR for test purpose. However my review is honest and unbiased as always. Yaas! Was waiting for your thoughts on this one. I hope it suits sensitive skin because I wish to try it. Thanks for this review.